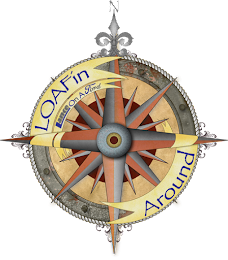 This was my First Post on the LOAFing Around blog, but after starting this blog I realized that it is more appropriate to have it here. LANCE 855s - We've been gone 18 days and driven about 4580 kms so far. In general everything has gone well. This Lance camper is much better equipped than our old 1988 Maple Leaf unit was and consequently we had a bit of a learning curve with some of the mechanicals and equipment that we're carrying. Energy - We have 4 potential power energy systems (solar 12v, electric a/c, vehicle d/c, propane). One of the most important things to learn (or, in our case, remember) is WHEN and under what circumstances to use any of these. As examples, the propane should never be on when you're driving (it's dangerous), only use the fridge on vehicle d/c when you're driving (it drains the solar otherwise), don't use the solar if it drops below 12 volts (may be difficult to recharge). Planned Storage Upgrades - Custom rear wall storage for a spare tire, additional fuel (jerry cans), aluminum tool bins, canoe & bike racks, fishing rods. FORD F350 4x4 CC SB gas - Our previous truck was a 1994 Ford F350 4x4 RC LB diesel. I miss the diesel engine. So much stronger and willing to work, but this 6'2l gas mated with the 6 speed auto is no slouch. Were presently hauling about 3000# and the max payload capability with our present suspension is 4000# so we have plenty of reserve capacity. Planned Suspension Upgrades - I will be adding cabover to cowl struts to control the 'porpoising' and undulating ride on rough roads. The rear dropped about 1 - 2 inches after loaded so depending on how much additional weight we carry I will be adding either air bags or additional helper springs in the rear. The stock tires that came with the truck are inadequate for much of the driving we will be doing (10 ply a/t radials). Once I wear them out they will be replaced with a taller more aggressive g-series 14 ply tire with at least a 2-ply sidewall. Taller tires may require a mild lift of 2 - 3 inches. Planned Exterior Upgrades - Addition of a front utility bumper that will include a brush guard, stone grill and hd safety/fog lights. Well ..... those are most of the anticipated upgrades for now. This is what the inside of a truck camper looks like - think you could spend 5 months here?